Between 2011 and 2014 the annual NMG survey of households, commissioned by the Bank of England, included questions on whether a household’s income over the past year had been higher or lower than expected. Households were asked how large that difference was, and how their spending had changed as a result. A larger share of households reported unexpected income losses than reported unexpected gains, and the majority of these unexpected changes in income were fairly small relative to income; the median shock was £2,000 compared to median household income of around £37,000. But some people reported much bigger surprises (Chart 1). This post summarises recent research analysing how people adjusted their spending in response to these unexpected changes in income. Using the survey responses we can calculate how much spending changed for each unexpected pound of extra/less income: known as the marginal propensity to consume (MPC). Based on the full sample, we find that an unexpected increase in a household’s income leads to an average rise in spending of just 14 pence for each extra pound (MPC=0.14), whereas spending falls by 64 pence for every pound (MPC=0.64) that household income unexpectedly decreases (Chart 2). Taking alternative cuts of the data, MPCs out of positive shocks range from 0.06 to 0.17 and 0.47 to 0.68 for negative shocks. This asymmetry in response was consistent across all four waves of the survey. Digging down into individual responses, the low MPC out of positive income shocks is driven by the majority of households with positive income shocks reporting an MPC of zero (Chart 3). There is much greater variation in the MPCs from negative income shocks, with some households reporting not cutting spending at all, and others reporting cutting spending by more than the change in income. There is a large stock of academic work, using a variety of approaches, which estimates MPCs (for example Jappelli and Pistaferri (2010) for a review), some of which explores these types of heterogeneities in how different households respond to a shock of the same sign. But few studies look at the consumption response to positive versus negative income shocks. Standard economic theory suggests that spending should depend on a household’s expected income over their life cycle. In that world households behave symmetrically – increasing spending by the same amount in the face of the positive shock as they would cut spending in the face of a negative shock, presuming that the two have an equivalent effect on their lifetime resources. What then should we make of our asymmetric MPCs? 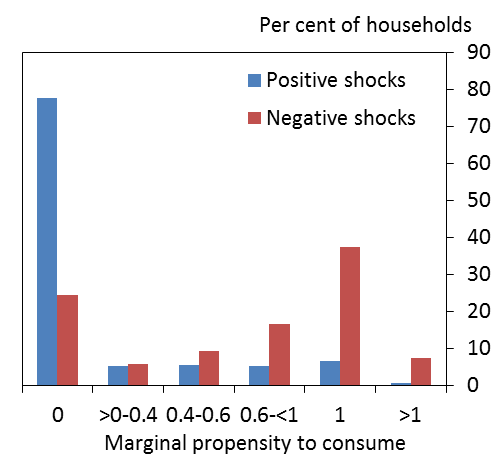 What might explain why households respond by much more when the shock is negative? In fact there are several theoretical mechanisms that would predict the type of asymmetry that we observe, and we describe the evidence for three below. The first explanation is that the types of households that receive positive and negative income shocks are simply different. For example, if the households that received negative income shocks could not access credit to help them smooth spending in the face of the shocks (leading to an MPC of close to one), but the households that received positive income shocks could, that could explain the greater MPC following negative income shocks. While the two groups look similar in terms of their income and debt positions, households that received negative shocks reported that they had significantly fewer assets and were more likely to be credit constrained than those who experienced a positive income shock (Table 1). Quantifying this more formally, using what is known as propensity score matching (which attempts to control for the probability of receiving a shock of the opposite sign based on observable characteristics), suggests that these differences in characteristics could account for around a quarter of the overall difference in MPCs out of positive and negative shocks. A second possibility is that the asymmetry results from the effects of receiving a negative income shock on expectations for future income. Theory describes a `precautionary savings’ motive for households in the face of income uncertainty, whereby they want to hold higher savings due to the risk that they might have lower income in the future (Caballero 1990; and Carroll 1992, 1994 and 2001). Households concerned about not having a buffer of precautionary savings might not want to dip into these savings when income falls unexpectedly, and so cut spending by a lot. These households may also only spend a small amount from an unexpected windfall, putting the remainder into savings. We see some evidence in support of this, as households that receive negative income shocks are more likely to report being uncertain about income in the following year. Further, for those households experiencing a negative shock, the MPC increases with the probability that they place on a further fall in income in the future: the average MPC was 0.49 for households reporting that there was no chance of a future fall in their income; 0.63 for those reporting some chance of a future fall in income; and 0.72 for those reporting that a future fall was very likely. On the other hand, there was no significant difference for households that received positive income shocks. Our final explanation for the asymmetry appeals to the idea that the shock itself might change a household’s circumstances and their ability to borrow (‘occasionally binding constraints’). The premise being that an unexpected fall in income can only ever exacerbate a credit constraint, whereas a positive income shock (provided it is large enough) may be able to ease a constraint. When households are credit constrained they are unable to increase borrowing to smooth through any falls in income. These households therefore have to cut spending significantly, consistent with a high MPC. But when income increases, they may be able to save some of the windfall and smooth the higher consumption over a longer period. This implies a potentially smaller initial spending response to a positive income shock than to a negative one. We are able to replicate this result in a very simple partial equilibrium model of consumption, which incorporates an occasionally binding borrowing constraint (following Guerrieri and Iacoviello (2015)). Our exercises suggest that differences in the balance sheet positions of the two groups, precautionary savings, and occasionally binding credit constraints are likely to be important factors in explaining the asymmetry. But there may well be a few additional explanations which we are unable to test for. All waves of the survey were conducted in the wake of the financial crisis, which could have affected the behaviour of all households, e.g. if uncertainty was elevated and all household were behaving in a cautious way. Households may weight the prospect of losses more heavily than the prospect of gains (Kahnemann and Tversky, (1979)). And finally, it could also reflect some desire to appear financially responsible when responding to the survey, which results in households reporting very little extra spending in the face a positive windfall, but a large cut in spending where the shock is negative. The asymmetry that we document could have important implications for the way that households respond to changes in their income that are brought about by monetary and fiscal policies. For example, changes in monetary policy redistribute income between borrowers and savers (Cloyne, Ferreira & Surico (2016)). Borrowers reported higher MPCs than savers out of both positive and negative income shocks, as is typically assumed, but the asymmetry in MPCs was clearly present for both groups. Such an asymmetry in MPCs implies that, at least in the short term, a given interest rate rise would have a larger contractionary effect on spending than the expansionary effect from an equivalent fall in rates, although households may respond differently to small changes in rates than they do to large changes in income. A really, really interesting read. Thank you for your thorough work. Kahnemann and Tversky’s work possibly deserves more than just one line referencing it but other than that, this is one of the best posts I’ve read here so far. This asymmetry is far from surprising – the last formal economics I studied, 10-15 years ago, was ‘introductory Microeconomics’, and the asymmetry of income shocks was one of the first topics covered, although it was described as ‘diminishing marginal returns on increased income’. It’s somewhat surprising from a non-economists’ point of view that MPC is assumed by many economists to be symmetrical – it seems fairly intuitive that receiving an unexpected inheritance of £100 is very different from having £100 stolen, as an example. How about the possibility that people are already consuming at their optimally desired level? I’ve gotten in the past substantial raises through new jobs, promotions etc. and don’t think i’ve ever decided as a consequence to increase my spending. I saved it, possibly with the idea at back of my head that it would allow me to retire a couple years sooner. I was already consuming as much as I needed and any excess is just saved up. Admittedly that probably only applies to people at much higher income levels than those studies were targeting. 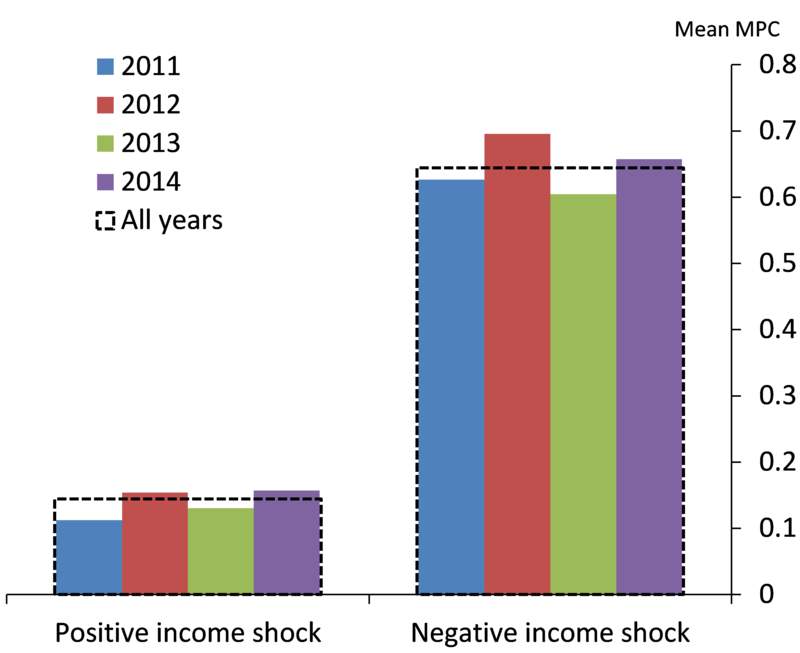 Its really interesting that the mean income is the same for both positive and negative shocks. My first thought before I read the post was that perhaps those on lower incomes are more likely to experience a negative shock because lower incomes may be associated with less stability in income i.e zero hours contracts etc. But I wonder if maybe the type of employment is a determinant of the probability of the type of shock? i.e. if someone is self employed their income could be more volatile and perhaps more at risk of a negative shock, and this may make it harder for them to access credit? 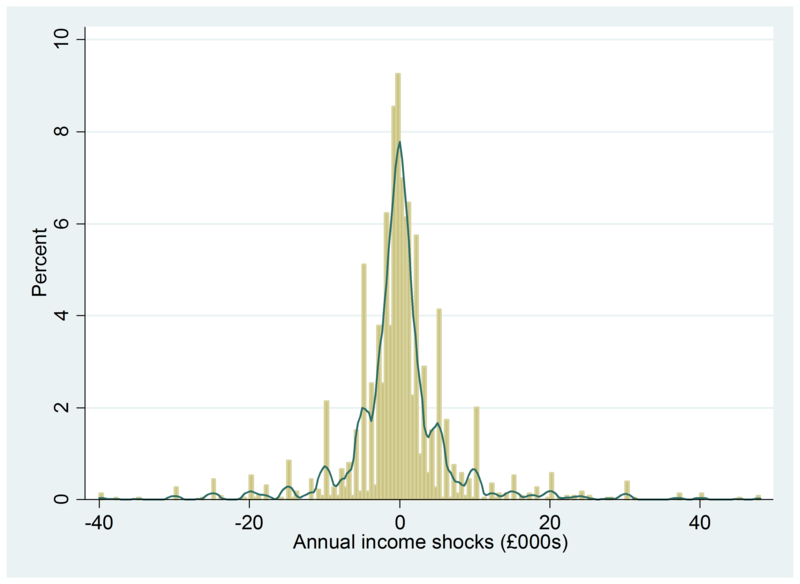 Also, does the effect of the income shock on MPC depend on income itself? i.e. a negative shock at lower incomes might mean consumption is cut more because individuals may not be willing to take on debt if they feel it may be harder to service if their real income falls any further. Perhaps this would be a non linear effect because those at very low incomes may have liabilities they must meet and so must ‘borrow to survive.’ Therefore the fall in consumption would be less than those on incomes just above them who are just able to cover their liabilities even after the income shock. I read on the BBC news website that some of the increase in unsecured debt is down to people borrowing to survive but they didn’t quote what % they made up of the total number of borrowers.